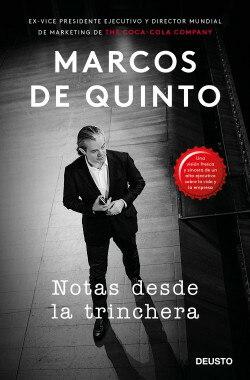 Marcos de Quinto dedicated his entire life to managing companies, brands, products, and emotions. He has worked on every continent, in a wide range of economic situations and in different cultural contexts with an enormous organizational and human diversity. In this book, he offers his life experience and his particular way of viewing the world and labor relations. Above all the noise of so many supposedly revolutionary methodologies, the author proposes returning to the fundamentals of marketing and management, to what continues to exist beyond all the fads, to indispensable formulas for transforming organizations and successfully meeting business goals. De Quinto passionately asserts that the businessman, executive, or manager has to be ready to disobey, to swim against the current, to detect what doesn’t work and to be brave enough to oppose it or fix it. Doing so requires a knowledge of marketing and management, but also of the world, a willingness to open the eyes and ears, to understand diversity, and to cultivate the humanistic sensibility that is indispensable for aspiring to be a leader.